Three computer programs used together can give fingerprint grading greater consistency and objectivity, claim researchers at Penn State University. 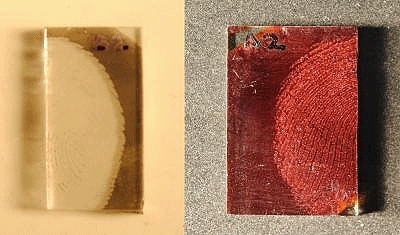 Lakhtakia’s team created a process using three inexpensive computer programs to grade a fingerprint for the availability of ridge detail for subsequent identification. Computerised grading ensures standardized evaluation to a degree finer than any human can accomplish and results of the research at Penn State have been published Forensic Science International. The three separate computer programs include the FBI’s Universal Latent Workstation — usually free to qualified agencies, the open-source image editor GIMP and a simple custom program written in Mathematica to count pixels. Investigators photograph the fingerprint—developed for visualization or not—and run the picture through the Universal Latent Workstation. This program is said to create a simplified map of the fingerprint by designating colours to four area types. The background area is black, areas with definite ridges are white, and debatable regions are yellow and blue. The GIMP editor converts the map file into an image file with red-green-blue colour values. The RGB values are stored as number clusters that a computer program can translate into binary sequences useable in a mathematical equation.